Today we're going a little bit colorful...okay, very colorful but "bold is in", correct?. 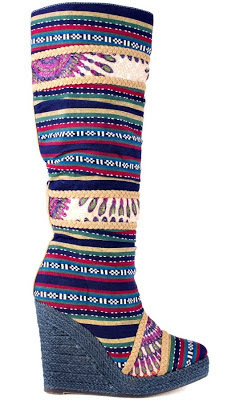 How about an an all-over tribal printed boot for fall? This Michael Antonio Eiken Boot has a bit of slouch which gives it a bit of a boho feel. 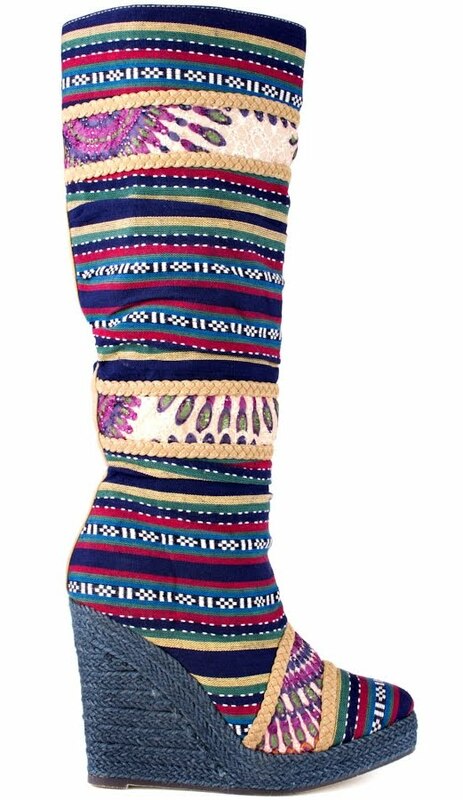 It's textured patterned fabric with bursts of colors and stripes that start from the vamp to the top of the shaft gives its southwestern flare. Adding to this attention grabber is a faux suede braided trim and an espadrille covered 4 1/2" jute-wrapped wedge with 1" platform.The Eiken comes in four colors with the blue probably being the most subtle but then again, as I said, bold is in. So ladies, do tell, will you be slipping these on your feet this fall?